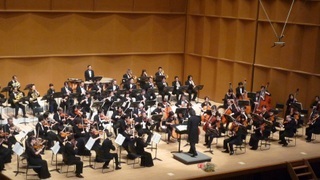 Founded in 1967, the Sakata Philharmonic Orchestra is non-professional orchestra based in Sakata-shi, Yamagata, Japan. We are a player-run group. Our aim is to provide a friendly relaxed group for adults to make music and bring the pleasure of music to a diverse audience, young and old, in the area. We put on concerts at least twice a year under a professional conductor. The Sakata Philharmonic Orchestra has been performing at Sakata Civic Hall "Kibou Hall" since it opened in 2004. In 2008 we were delighted to welcome Masahiro Izaki as its new guest conductor. We recently performed Dvorak Symphony No. 7, Brahms Violin Concerto (2009/10); Saint-Saens Symphony No. 3, Dvorak Cello Concerto (2010/11); Brahms Symphony No.3, Rachmaninoff Rhapsody on a Theme of Paganini (2011/11). Upcoming: Mahler Symphony No. 1, Bruch Violin Concerto No. 1, Mozart Overture to "Don Giovanni" (2012/11). We also performed operas including "Le nozze di Figaro", "La traviata", "La Boheme" and "Madama Butterfly". In 1987 the Sakata Philharmonic Orchestra visited Sakata's Sister City, Zheleznogorsk-Ilimsky, Irkutsk Oblast, Russia and in 1993 it made the first visit to Yuza-machi's Sister City, Szolnok, Hungary. As a member of the Amateur Orchestra Association of Yamagata, we appeared in the 27th annual symposium of the International Horn Society, the '95 International Horn Festival in Yamagata. The group meets most Saturdays between 7:00 pm and 9:00 pm at Fujimi Community Center, Sakata-shi. We are welcoming adult amateurs, no auditions necessary. We are particularly seeking violins and Double Basses. Please get in touch if you are interested in joining.